Momad, Fashion in Madrid, evolves as a brand. Having served as the umbrella brand encompassing the Momad Metropolis and Momad Shoes fairs over the last few years, from now on it will lend its name to the great global fashion fair of the Iberian Peninsula. In addition to hosting clothing companies sectorised by fashion concepts and styles, its next edition, which will run from 8 to 10 February, will also accommodate the footwear and accessory brands that wish to associate with fashion retail. Nevertheless, those footwear companies that want to present their collections in a specific Footwear event may do so at the new ShoesRoom by Momad, which will be held from 1 to 3 March in La Nave, a new stage outside Ifema. Furthermore, brands that wish to participate at both meetings may do so whilst enjoying a special price. 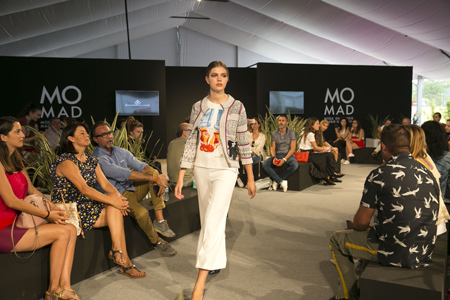 Organised by IFEMA, Momad will be held in Halls 2, 12 and 14 of Feria de Madrid, where the main national and international clothing, footwear and accessories brands will be located for Autumn/Winter 2019-2020, alongside the Fast Fashion proposals for Spring-Summer 2019. This is a meeting long-awaited by all professionals, as shown by the fact that 94.3% of buyers attending previous editions recommend visiting the fair. The event will coincide in dates and place with Bisutex, the International Jewellery and Accessories Show; MadridJoya, the International Exhibition of Urban and Trend Jewellery and Watchmaking, and Intergift, the International Gift and Decoration Fair. This will allow synergies to be created between all these shows, and will make it easier for buyers to access all the fairs with the same pass. Momad's offering will be classified by product type: Urban, Casual, Men's, Party, Contemporary, Metro Space, Leather and Coat, Footwear, Accessories, Lingerie and Swimwear, Plus Sizes, Sustainable Fashion and Momad 4.0, keeping the location of each sector the same as in previous events. In this edition, visitors will additionally have direct access to each of the halls of the fair without having to pass through Hall 2, as in the last two events. The event will once again feature the MOMAD Catwalk, the MOMAD Forum and Speaker's Corner activities programme, in order to help professionals find useful tools and resources to face the new challenges as the market demands. It will also include the Summer Terrace, with its rest area with music and gastronomy. Along with all of this, as in previous editions, MOMAD Metropolis will organise an ambitious International Buyers programme to contribute to promoting, streamlining and opening up new markets for the exhibiting companies. Accordingly, in its September edition, the event increased the number of international buyers by 20,9%. The next edition of the exhibition will have a new schedule. On 8 and 9 February, it will open from 9:30 am to 7:00 pm, and on 10 February, from 9:30 am to 4:00 pm. What’s more, IFEMA has launched a new project for the Footwear sector, called ShoesRoom by Momad, which will be launched from 1 to 3 March 2019 -From Friday to Sunday-, in La N@ve, an industrial-style site close to the centre of Madrid. This new project replaces Momad Shoes. ShoesRoom by Momad has been developed by IFEMA, in collaboration with FICE, with the aim of providing the sector with a new commercial platform in line with the current market context, and which will take place on suitable dates and prove useful for this industry. In addition, ShoesRoom by Momad will have a showroom format, a lower investment cost for participating brands, and the same modular decoration for all exhibitors, so that the product is the real protagonist.